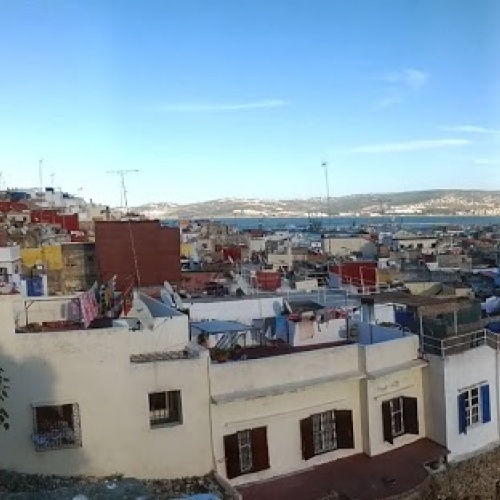 It seems like my time in Tangier has come and gone in the blink of an eye. While Morocco has been completely different than anywhere else I've visited on this trip, it's been interesting to see a completely different culture in action. This is also the first place I've visited this trip where I can go almost an entire day without seeing any tourists. It's a much more "immersive" feel compared to every other city I've been to on this trip. I slept pretty well last night after going to bed really early. After eating a quick breakfast in the room I went out for a cafe au lait at the Cafe Paris again. I had the coffee and read there for about an hour. The place was starting to fill up so I left so other people could use my table. I read by a nice overlook on the main street for a while before heading down to the Comedia restaurant I ate at yesterday to have lunch. 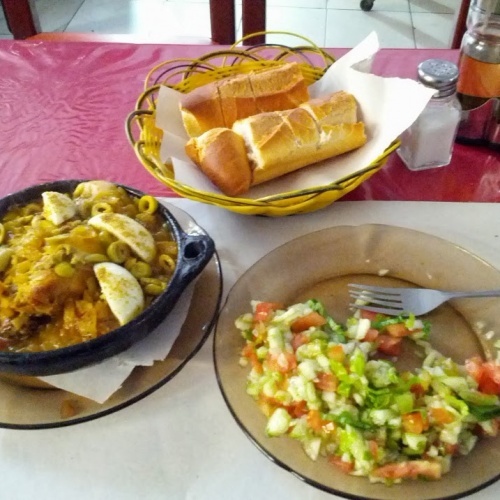 Today I had tajine chicken with fries, a little olive salad and some orange juice. I'm not an olive fan, but it seems like people here in Morocco put them on or with everything. Since they were there I had a few. I liked the brown ones the best, then green and black the least. Once I finished lunch I came back to the hotel to read and relax for a bit. I talked to my parents for a while and then got ready to head out for dinner. I went to a place down the street and got "super shawarma". Apparently super meant it came with salad and fries. I know they say to avoid the salads but I hadn't had any real greenery in a while so I ate it. I didn't get sick from the salad I had the first night here so I took my chances. So far so good. On the way back from dinner I got another one of those freshly fried and sweet filled donuts. Today they were filling them with some kind of apricot jam. I liked the honey mixture they used the other day better but it was still really good. My flight tomorrow doesn't leave until about 11:30am so I don't really need to rush. I'll probably catch a cab between 8:30 and 9am which should give me plenty of time to get to the airport and get through security. It'll be nice to get back to Spain where I don't feel quite so alienated. 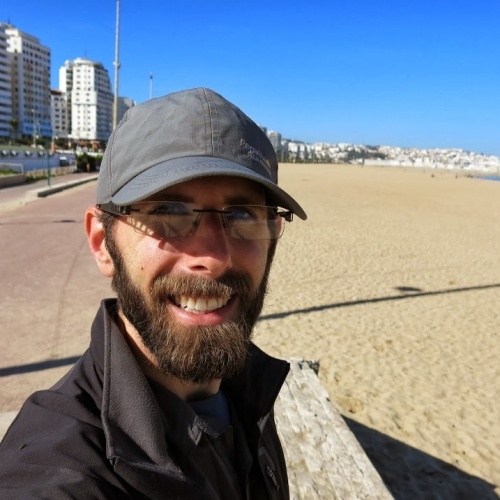 Being able to understand signs in Spanish and having the faded memory of Spanish classes from high school makes it a lot easier to go out and get around. The mix of Arabic and French here is really tough. After dinner last night I started to feel the onset of a sore throat. I went to bed but was tossing and turning all night. I finally got up around 9am and ate a quick breakfast. I was content with not really doing much today so my body could fight the sore throat. Fortunately my throat doesn't feel as bad but I've got a bit of a headache now. I worked on ClearCheckbook until about 11 then went out to find some food. I had passed by a place the other day that looked pretty busy and the prices were pretty reasonable so I went in there for lunch. They had a chicken couscous dish as the daily special so I ordered that. 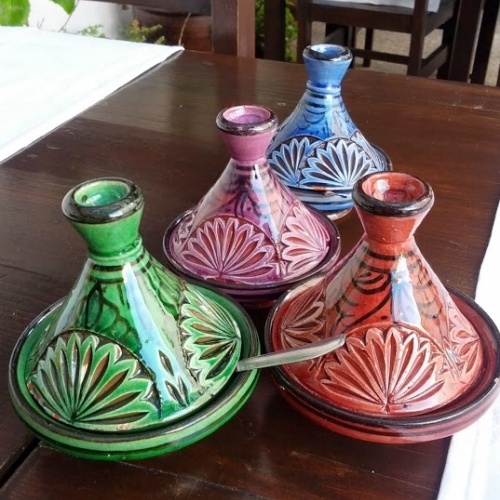 It came in a tajine and was served with some chicken broth that you ladle over the couscous/veggie/chicken mixture. They also gave me some kind of really thin yogurt in a glass and a little olive salad. I'm still not huge on olives so I didn't try that. The yogurt drink was alright, but a little sour for my tastes. I went to various areas and read and relaxed for the next couple of hours. I'd alternate between sitting in the sun, the shade, and various sitting areas around town. By about 3:30 I knew I wanted to start my journey back to the hotel. I swung by a little bakery and got some kind of sweet roll for tomorrow's breakfast then went and picked up some more apples before swinging by a pizza place I read about online. The pizza was alright, but not for the price. It'll be nice to get back to Spain where I have a wider variety of food choices and a kitchen to make what I want. I think that's part of the reason I'm getting a little sick... lack of healthy food for the last week. The forecast for tomorrow is calling for a little bit of rain so we'll see how that plays out. I still might try to do a little souvenir shopping too. The only downside is that I'll have to carry anything I buy with me for the next month since shipping costs are so outrageous. Even though I haven't been setting an alarm, I've still been waking up within a few minutes of 8am. I didn't have any plans again today so I stayed at the hotel until about 10:30am when I set out to find a cafe to hang out at. 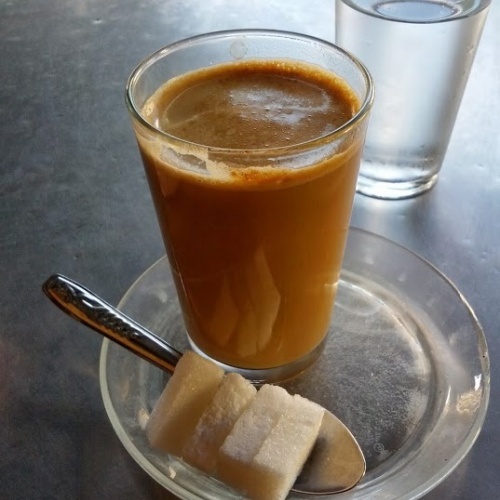 All week I've seen people drinking this really light brown drink at the cafes around town and they always looked thick and delicious. I wasn't sure what the actual drink was so I went to the Cafe Paris today (directly across from the French Embassy) and took a wild guess. I ordered a cafe au lait. My guess was right. 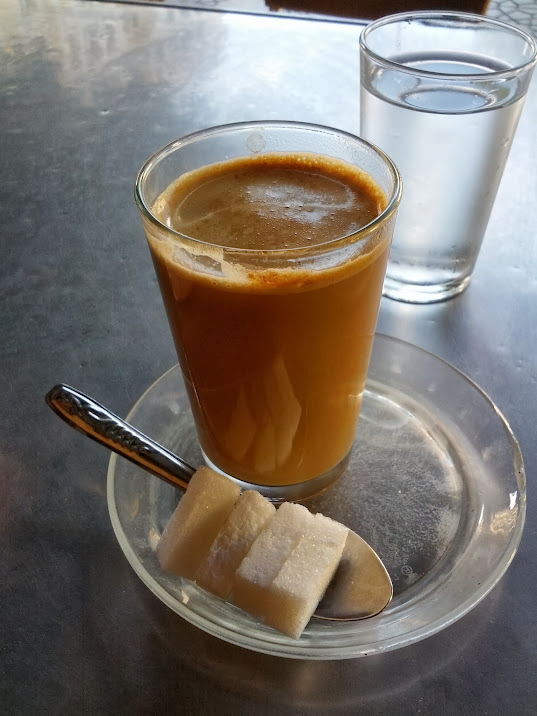 They bring out a glass cup filled about 1/3 of the way with strong coffee and then they have a small pot of hot milk that they fill the remainder of the glass with in front of you. I'm not sure if it's the coffee, the amount of milk, the type of milk, or what, but it's some of the best coffee I've had all trip. I sat at the cafe and drank the coffee and people watched for a while. I'm not sure who I was sitting next to, but the guy seemed to know everyone on the streets. People would come by and sit down and talk with him for a few minutes then carry on with whatever they were doing. I started to get hungry so I left to go find some food. Unfortunately the place I wanted to eat wasn't open yet so I found a quiet spot to read for a while. I was craving another coffee so before lunch I went to a different cafe and got another cafe au lait which tasted just as good as the first one. For lunch I had another shawarma meal from the same place as a few days ago. I went back to the quiet reading spot and read for a while longer before going to a nearby grocery and picking up some bread, cheese, ham and other random items for dinner. I also bought another 5L jug of water which should hold me over the rest of the trip here. Back at the hotel I've just been reading, working and eating. The sandwich was pretty good but I'm starting to crave vegetables. Without a kitchen it's really hard to prepare anything remotely healthy. They also say to stay away from the salads here because the water used to wash the lettuce can cause stomach issues. I guess I got lucky with the salad I had the first night I was here. I decided not to do breakfast this morning since I picked up a few things from the grocery yesterday. I didn't set my alarm either but I still woke up around 8, which is when I'd been setting my alarm anyway. I hung out at the hotel and did a little bit of work until about 10:30 then set off to walk the beach and find some food. I went down to the big park next to the beach and sat and enjoyed some relative peacefulness. The park is next to a big roundabout so the sound of cars and honking is ever-present. My trick with wearing headphones worked well. I didn't have anyone bother me the entire day. I wasn't really sure what I wanted for lunch so I walked around for a while before I settled on a chicken pizza. One of the main reasons I like hostels is the kitchens. It makes eating so much easier when you can make a sandwich or something else for lunch/dinner and not have to go out and find something. I made my way back to the hotel where I read on the rooftop terrace for a while then came back to the room and messed around on my computer. By the time I was getting hungry for dinner I was hit with the same uncertainty of what I was hungry for. There isn't really too much of a diversity when it comes to actual food here. A lot of shawarma/panini/pizza combined restaurants, plus random sandwich shops that don't have any prices or ingredients listed anywhere. Without having something to base my choices, I have to avoid places like that. After I ate another cheap pizza (nothing can come close to Naples pizza now), I was on my way back to the hotel when I passed this guy I had seen a few times selling fried dough that gets cut open and filled with honey then dipped in sugar. I wasn't 100% full from dinner so I figured I'd get one. Again, no prices or names of what it is listed anywhere, so I just pointed and gestured "1" and gave him a 20Dh bill (about $2.50 USD). I got quite a bit of change back so now I know they're not that expensive. The treat was delicious. Imagine a really good funnel cake/elephant ear/sopapilla and you get the idea of what it was like. I ate it at the big roundabout/park near the hotel then came back. There are a few other street vendors selling desserts I want to try before I leave. I'll have to limit myself to one a night though or else I feel like I'll have a sugar overload. I guess it's because I stick out like a sore thumb, but no matter where I go in the city, people are constantly coming up to me and trying to act as tour guides or ask for money. When you're in the medina and you make eye contact with a local, they see it as some sort of sign that you're in need of a guide or you're looking for help they can profit from. It really takes the enjoyment out of walking around when you have to constantly keep your eyes ahead and completely ignore people that come up and start talking to you. As soon as you say anything to them, they see it as you agreeing to need their help. Ignoring them, they'll follow you for about 10 seconds then finally wander off. Today I didn't really have a plan other than to walk around the medina and try to get photos of cool streets, archways and buildings. If I'd stop to enjoy a view or get off the tourist streets a bit, people immediately come up to you and start trying to lead you somewhere else. 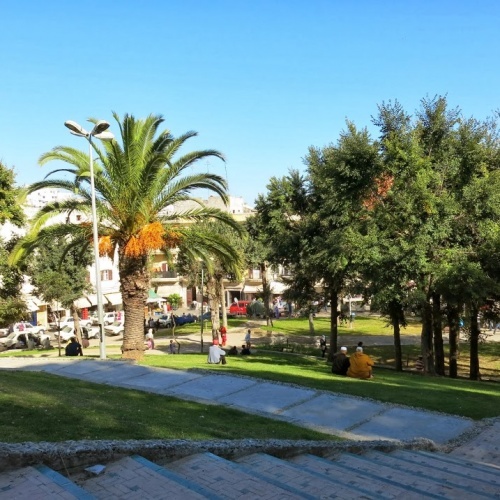 It got so frustrating that I eventually left the medina and sat in a big park for a while. Even there people see that I'm not a local and either try to sell me junk or start asking me questions. If it was simply people curious about me as an outsider I wouldn't care one bit. I'd be more than happy to talk with the people if it was truly going to be a conversation. I've actually had good honest chats with people who are working at restaurants when I order food and the staff at the hotel. Unfortunately when someone comes up on the street it's not for idle chat. 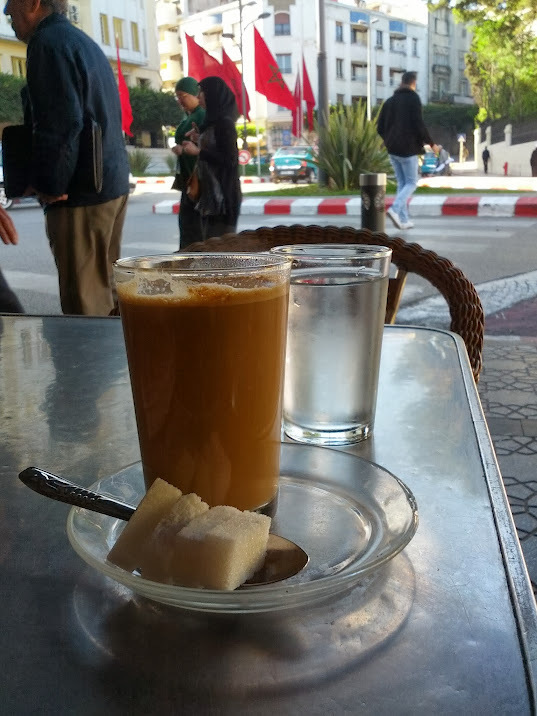 With four full days left in Tangier, I'm trying to figure out different ways to combat all the hustling. I think tomorrow I'll plug in my earphones and walk around listening to music. Maybe if I can't hear all the people trying to get my attention then it won't bother me so much. I still want to do a little bit of souvenir shopping before I leave so I might attempt that tomorrow too. This morning I had another huge breakfast at the hotel. After eating I went down to the beachfront and walked along the beach for a while. I found a park on the beach and read in the shade of a tree for a while. At about noon I worked my way over to one of the new busy streets full of shops and cafes and walked along it. The street was packed with people going about their daily business. Pretty much all the tea shops had a lot of people in them. Not wanting to miss out on another tea I found a place that had mint tea for 8 Dh and sat outside watching the busy seat while drinking it. 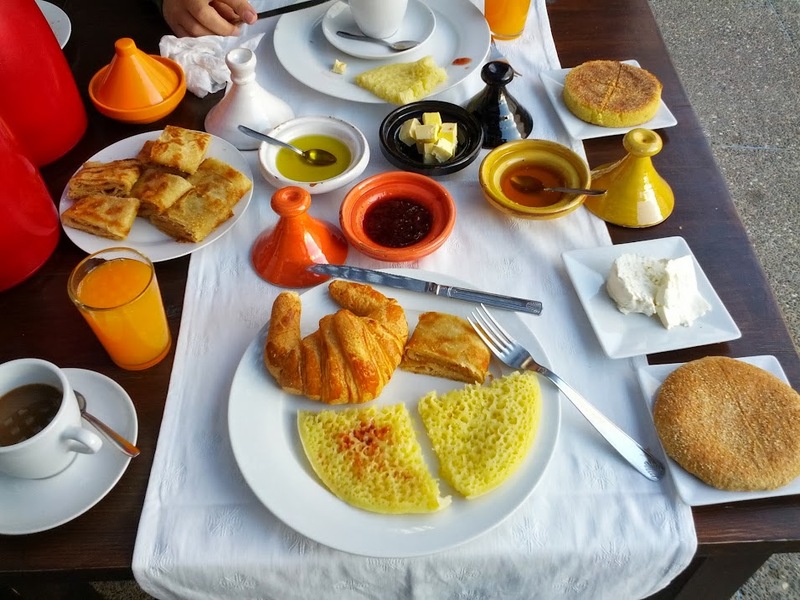 I hadn't really realized it but it dawned on me while drinking the tea just how much sugar and carbs I've been consuming while in Morocco. It seems like everywhere you turn there are sweet shops, honey/sugar rich pastries and tea shops selling the sugar infused mint teas. I'm not sure if it's because alcohol isn't prevalent at all here or what, but people sure do love their sweets. I came back to the hotel and read on the rooftop for a while before coming back to the room and relaxing for a bit. When I started getting hungry for dinner I set out in search of some food. I wasn't really sure what I was craving but eventually found another shawarma shop and got the chicken shawarma plate. It came with a pita, chicken, carrots, potatoes, rice, cucumber, corn and some of the garlic sauce on top. It was really good and for the equivalent of $4.75 it was nice and filling. 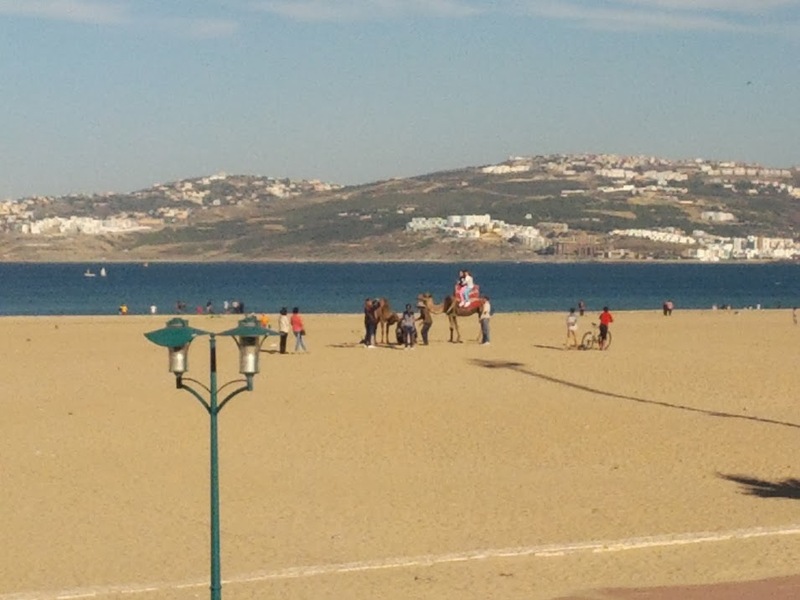 I'm starting to realize how Tangier isn't really built around tourism. Sure, it caters to the cruise ships but if you're here more than a couple of days there isn't really too much new to see or do. 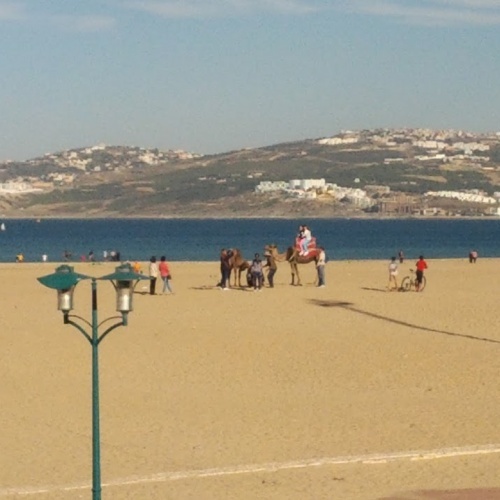 Aside from wandering around the medina or sitting by the beach there aren't really many sights to see. 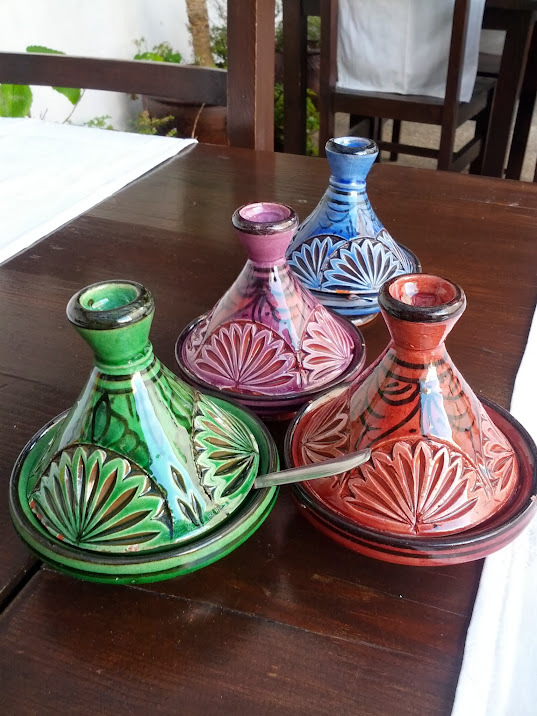 I think this week in Morocco is definitely going to help me refill my quota of relaxation and alone time, which isn't necessarily a bad thing. I'm not sure what I'm going to do tomorrow yet, but I'll probably start working my way deeper into the medina and just enjoy getting lost in all of the small streets. I slept pretty well last night. It was nice not having to deal with snorers, doors opening and closing, people moving around above or below me on bunk beds, plus the bed here is really comfortable. This morning I had a great breakfast at the hotel. 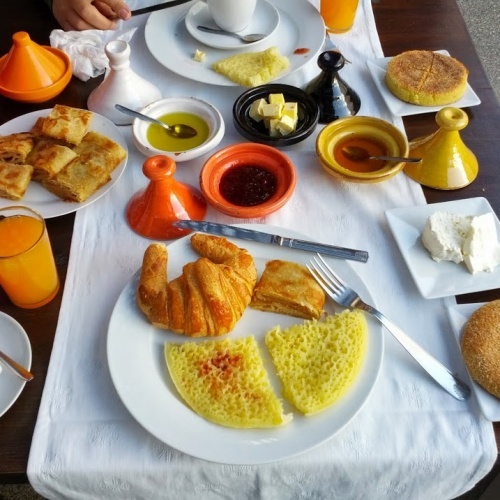 For 55 Dh you get fresh squeezed orange juice, coffee, fruit (bananas, grapes, plums, apples), several Moroccan breads (including a delicious mix between a crepe and pancake called a Baghrir), a croissant, jam, honey, olive oil and goat cheese. When I sat down, I was joined by a guy named Ben from New York. I'm glad he sat down or else there would have been an enormous amount of food left over. My goal was to make breakfast my biggest meal of the day since there was so much delicious food at my disposal. I ate or tried just about everything that was served to the table. Ben used to work here when he was a kid and has visited many times throughout the years. I had read you shouldn't drink the water here which I hadn't done yet, but I wanted to confirm this. I asked him and he said I'd be better off buying bottled water. After breakfast I went out and bought 5 liters of water for about $1.50 which should last me a good part of the week. After dropping the water off at the hotel and being sufficiently stuffed and caffeinated from breakfast I set out for the medina. I didn't really have any kind of destination in mind, and with no destination it's impossible to get lost, right? I walked around the maze of winding streets through all the leather, brass and antique shops plus all the people selling fruit and vegetables on the streets. There's even a huge indoor meat and fish market. The smells in those areas are quite overpowering. I mostly stuck to the heavily trafficked paths but I did get out of those for a bit and walked into the areas where you could tell tourists don't normally go. 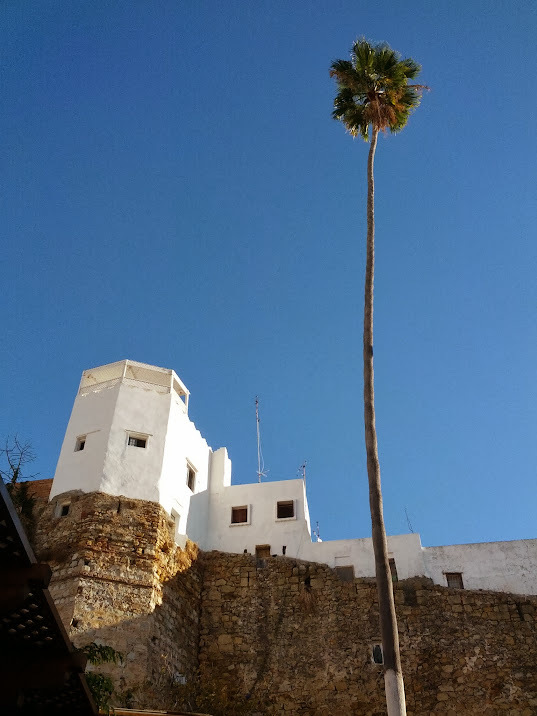 Eventually I stumbled up to the Bab-el-Assa and the Kasbah Museum. 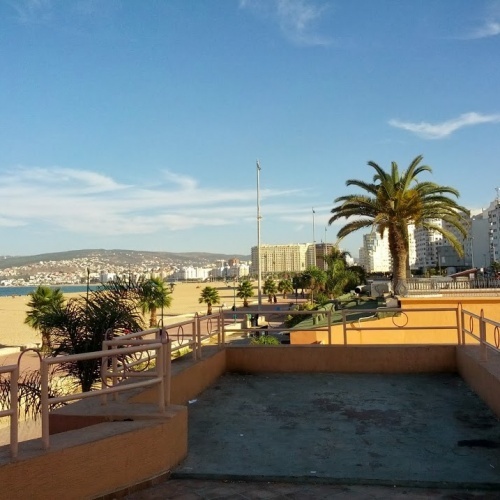 There were some really nice panoramic views from the area of the Strait of Gibralter and Europe. 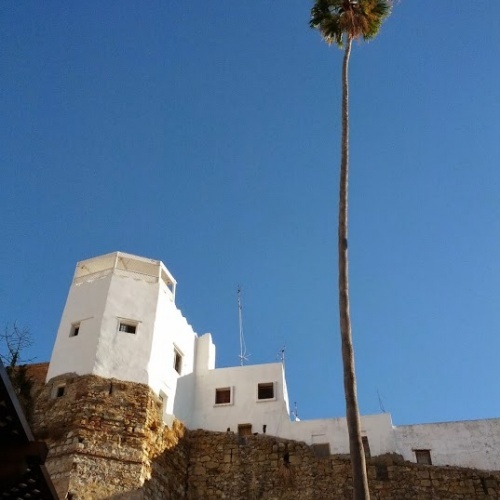 I went into the Kasbah Museum for the equivalent of $1 USD. 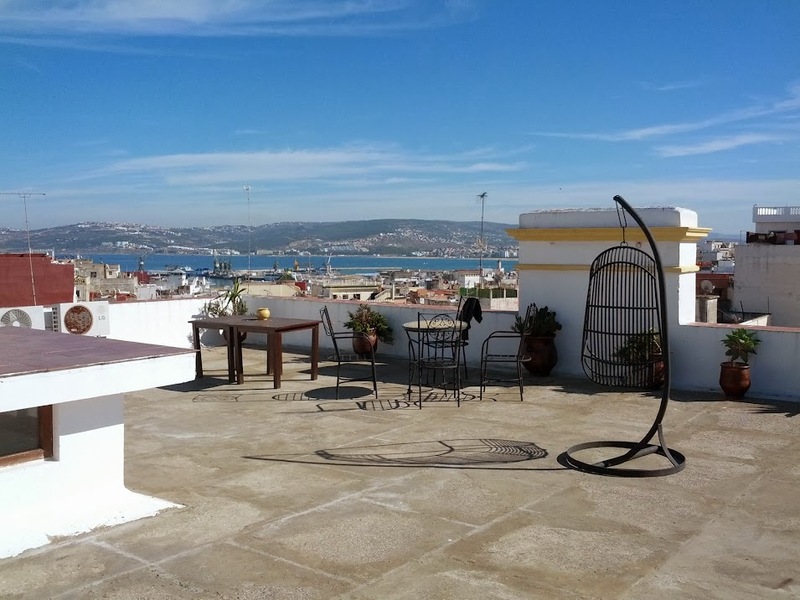 It was the former home of sultans and was converted into a big museum that showcased the history of Tangier from prehistoric times through the present. None of the displays were in English so I had to try and get the gist of what was going on by reading the Spanish information. Included in the museum is access to the gardens which were really nice. They had orange trees, banana trees and tropical plants and trees of all sorts. One of the big drinks here is mint tea. 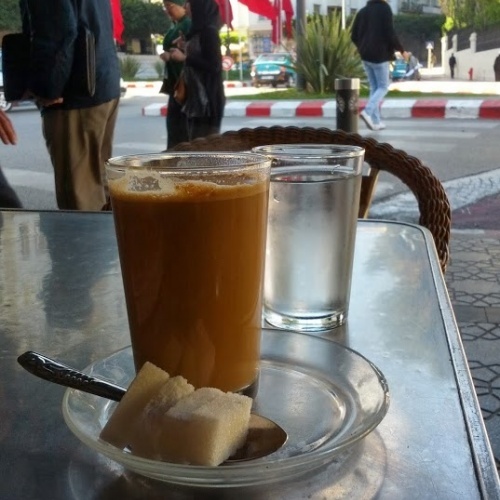 All of the travel sites and blogs I've read about Tangier say that you have to drink some of the mint tea. It was lunch time and I still wasn't hungry due to the huge breakfast so I walked around trying to find a place to drink a tea. One of the issues I faced is that a lot of the cafes don't have menus or only have menus in Arabic which is completely non-legible to someone who doesn't know the language. Eventually I found a cafe with a menu in French and ordered a tea for 10 Dh (about $1.25). The cafe was in the Grand Socco overlooking the main circle near my hotel. The tea itself was amazing. Imagine the best mojito you've ever had but instead of rum they used hot tea. That's pretty much what this tea was like. I sat out and people watched for a while before the bees started getting attracted to my empty glass. I came back to the hotel to read and relax for a while. By about 4 I was getting hungry enough to want to venture out for dinner. I had seen a place selling shawarma (an Indian stuffed pita style meal) for 20 Dh just down the street from the hotel. I went there and ordered one and it was amazing. They basically filled a pita with chicken, corn, lettuce, tomato, onion and some sauce and then hot pressed it all together. On the way back I saw some people selling clemintines for 2 Dh / kilo which is a crazy good deal. I picked up a kilo of them for the equivalent of 25 cents so I'd have some fresh oranges to snack on all week. Back at the hotel I went up to the rooftop terrace where they have some seats and I finished my Game of Thrones book. When I finished the sun was setting so I hung out there and watched the city as the sun went down. It was a really good day. 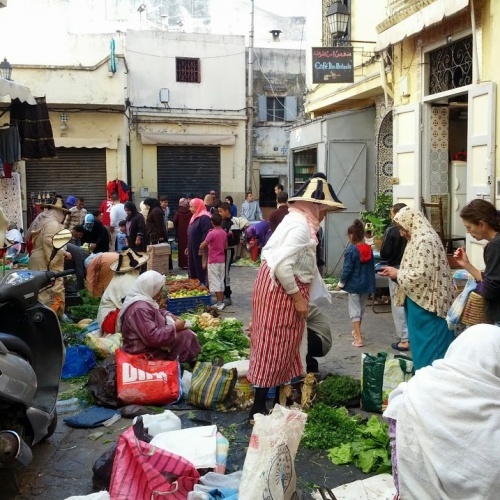 I wasn't hassled when walking through the medina (although I did see the vendors flocking to the cruise ship tour groups where they knew there was easy money to be made). I guess walking around as a solo dude without a camera strung around your neck makes you less of a target. I went to bed pretty early last night so I wouldn't have any problems getting up early today. 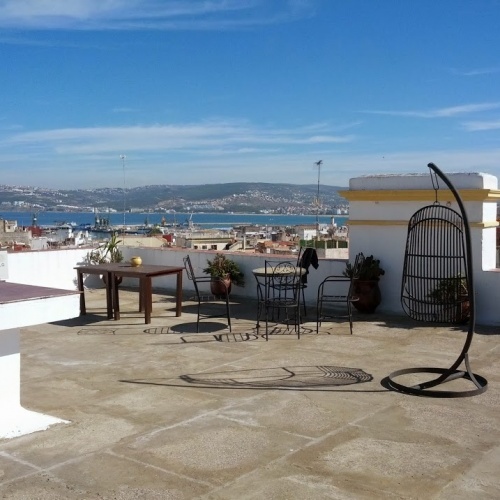 My flight to Tangier was at 12:15pm so I wasn't too rushed in the morning, but for some reason I wasn't able to check in online to my flight yesterday. I wanted to make sure I got to the airport a little early to make sure I got a good seat and to check my bag. I had some pretty delicious muffins for breakfast. They were filled with jelly and had cinnamon crumbs on top. They were basically my breakfast and lunch since I wasn't sure when I'd eat once I got into Tangier. I caught the bus to the Barcelona airport and arrived with plenty of time. I checked in just fine and hung out at the airport and read for a while before my flight boarded. Apparently I had nothing to worry about as far as getting a good seat went since the flight was about half empty. I wasn't expecting it but they served a little sandwich and coffee along with the normal drinks. I got a window seat on the exit row which was pretty cool. There was a lot of leg room and the skies were clear for the most part so I got to watch Spain pass by below me. When we got to the Straight of Gibraltar I could see both Europe and Africa at the same time. Everyone clapped when we landed (first time I've seen that in a while) and customs was a breeze. I withdrew the equivalent of around $200 in the local currency to last me the week. Everything's pretty cheap here it seems like so I think that should be fine. The weather was perfect when I arrived. It was fully sunny but not too hot or humid. 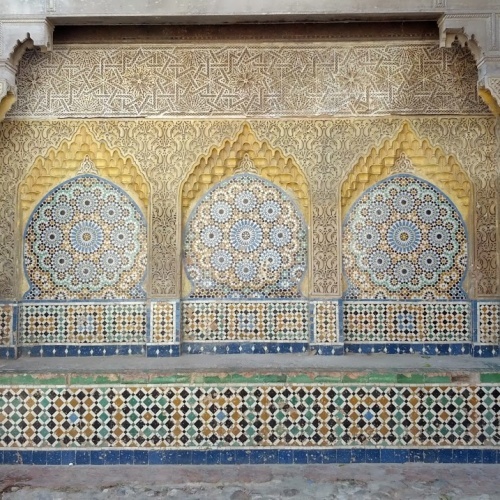 I got a taxi to my hotel (the Dar El Kasbah) for 150 MAD (about $18). The taxi driver didn't really follow any rules of the road. We were driving down two lane highways and he'd squeeze between the middle of two vehicles making his own third lane. After getting honked at numerous times we finally made it into the medina area where my hotel is. There were people, fruit vendors, spice shops and all kinds of other little restaurants and hole in the wall shops everywhere. I checked into the hotel which is really nice. In the States I'd expect to pay anywhere around 90-120 USD for what I got for about $40 a night here. They also have a huge breakfast made fresh every morning (you have to let them know the night before if you're eating breakfast here so they know how much to make). I'm going to try it tomorrow since it's pretty cheap and looked delicious. After I checked in I hung out in my room for a bit before deciding to go walk around for a little bit. 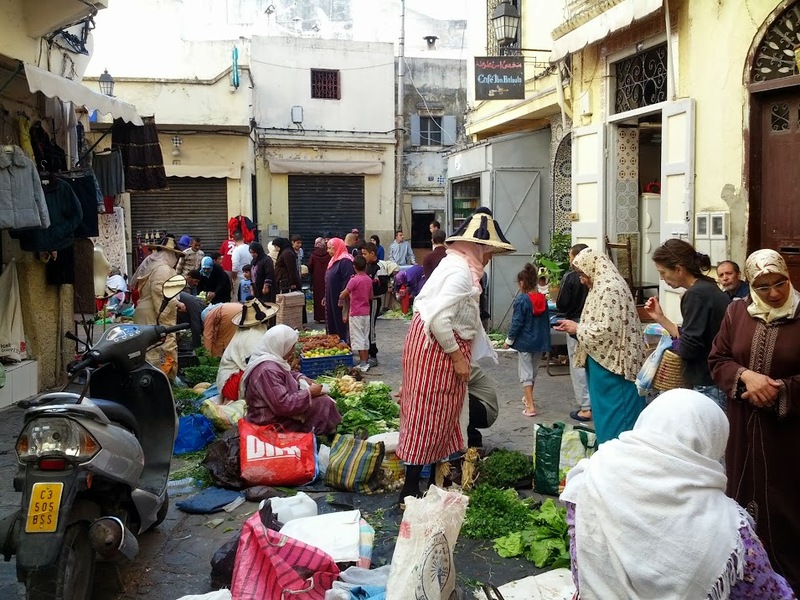 The medina (or casbah) is right behind my hotel and looked crammed full of people doing their shopping. 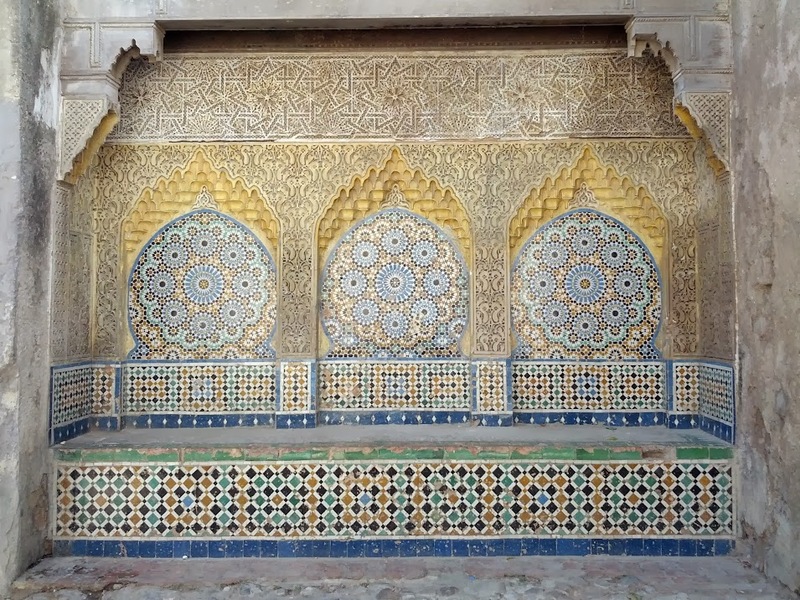 I was reading about it and experienced it today but people will come up to you around the medina and try to act as an unofficial "guide" where they ultimately lead you to a friend's carpet shop or something. They're pretty persistent so I think when I venture into the medina for real I'll just wear some headphones and pretend I can't hear them. It was a little overwhelming to tackle after a full day of traveling so I'll probably head into the craziness tomorrow. 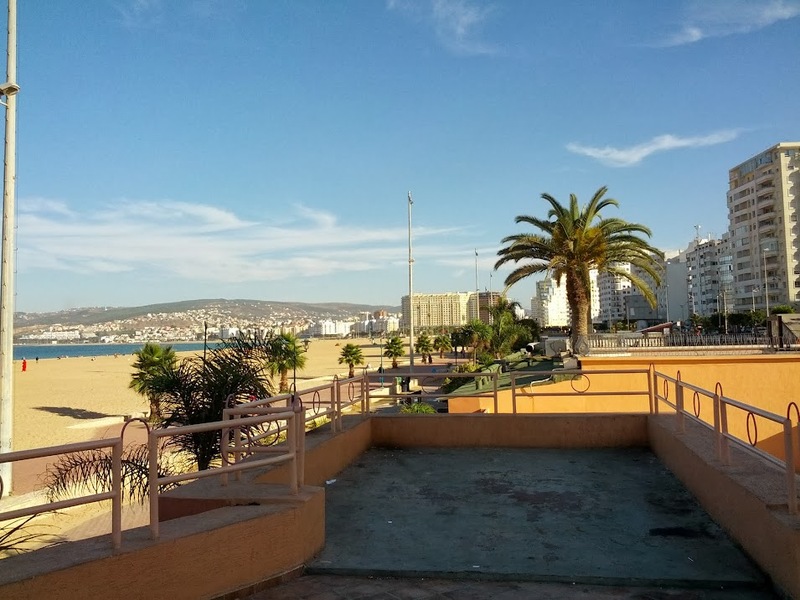 Today I walked around the area near the hotel a bit then headed down to check out the beach. Along the way I saw a little restaurant selling cheap tajine so I made note if it and would eat there on my way back. 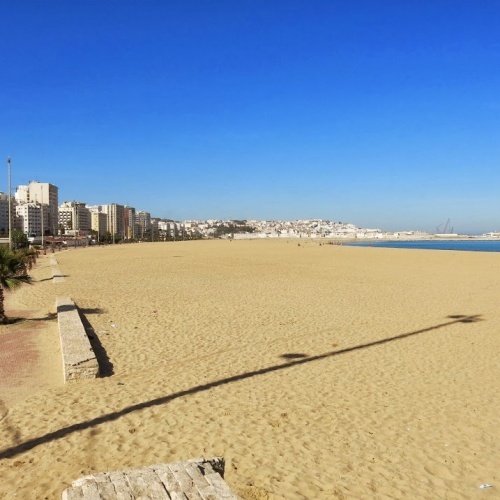 The beach itself has a nice tree lined street and the beach itself is huge. I walked along there for a bit but then headed back to get some dinner. I went to the one place I saw earlier. I wasn't sure the ordering process here (it seems like it's different in every country). I told the guy behind the counter what I wanted and he pointed to a table to sit down. He started making my chicken but I think I was supposed to sit down first. Oh well, it all worked out in the end. After a few language barrier issues when he asked what kind of salad I wanted (I thought he was just asking if I wanted a salad) it was all taken care of. 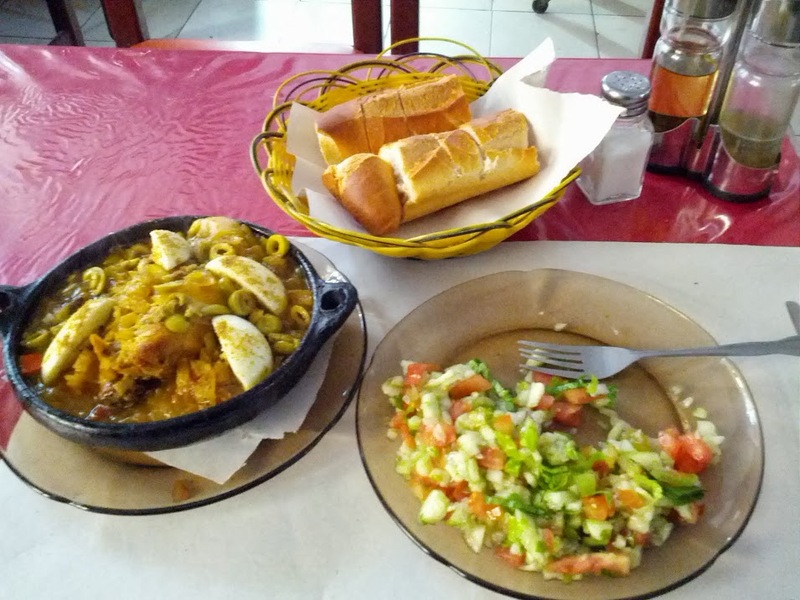 I ended up getting tajine chicken with a Moroccan salad (cucumber, tomato and onion) with some bread to soak up all the juices in the tajine. The tajine itself had chicken, hard boiled eggs, olives, onion, carrot and possibly tomato all cooked in a broth. All of the spices and food mix together and turn nice and soft so it's almost like eating a thick soup. Very very good with all the spices they use too. The entire meal only cost me about $5.50 too. I wanted to pick up a few things to bring back to the hotel but the shops I saw earlier had shut down for the day so I just came back to the hotel. 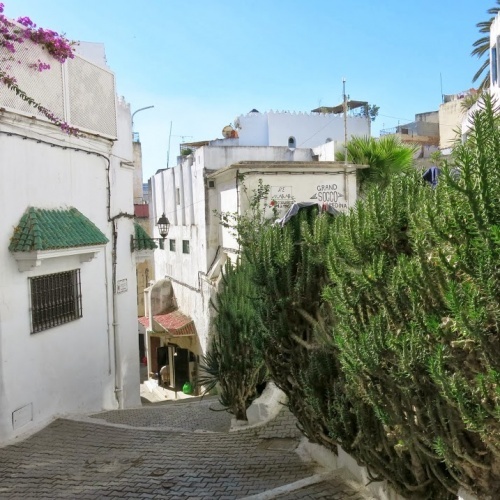 My first impressions of Tangier... It's not quite as crazy as I thought it might be, but I've only just seen a little glimpse of it. I'm sure I'll be blown away when I actually enter the labyrinth of the medina with all of its zigzagging and narrow streets. It's interesting to have the heavy arabic influences here as well as the prayer towers coming alive and broadcasting prayers at random times of the day.